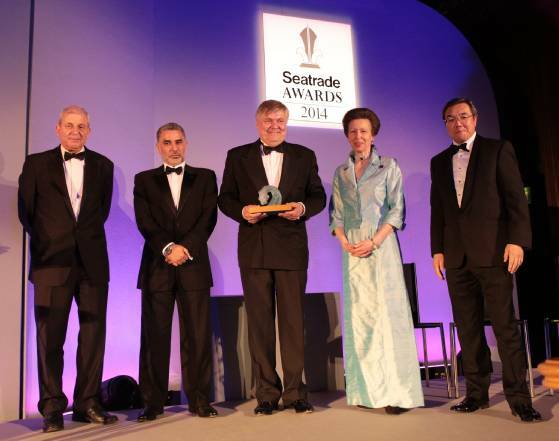 DNV GL Group President and Chief Executive Officer Henrik O. Madsen received the coveted Lifetime Achievement Award at the Seatrade Awards in London this week. Recognized for his ‘inspirational leadership’ Henrik O. Madsen was presented the award in the presence of HRH The Princess Royal, together with 400 industry leaders and professionals from around the world. "I am extremely flattered and humbled to receive this prestigious award. I started my journey in DNV in 1982 and much has happened since then. I have had the privilege to work with forward-thinking management teams with foresight allowing the organization to develop to the DNV GL Group as we know it today. Indeed, our vision to make a global impact for a safe and sustainable future remains in place today and will remain so in the future. We all know that the world cannot progress without shipping, and that the shipping industry is expected to become safer, smarter and greener. Our goal is to find solutions that create value and growth for our customers and reduce the strain on the globe," said Henrik O. Madsen. In its assessment, the independent judges gave weight to the leadership Henrik O. Madsen has rendered to DNV and its development under his headship. “The awards provide an opportunity to celebrate maritime excellence and achievement. Mr Madsen has demonstrated substantial success over the years and most recently presided over DNV’s merger with GL, in what has been the biggest consolidation yet seen in the sector,” said Chris Hayman, Chairman, Seatrade.